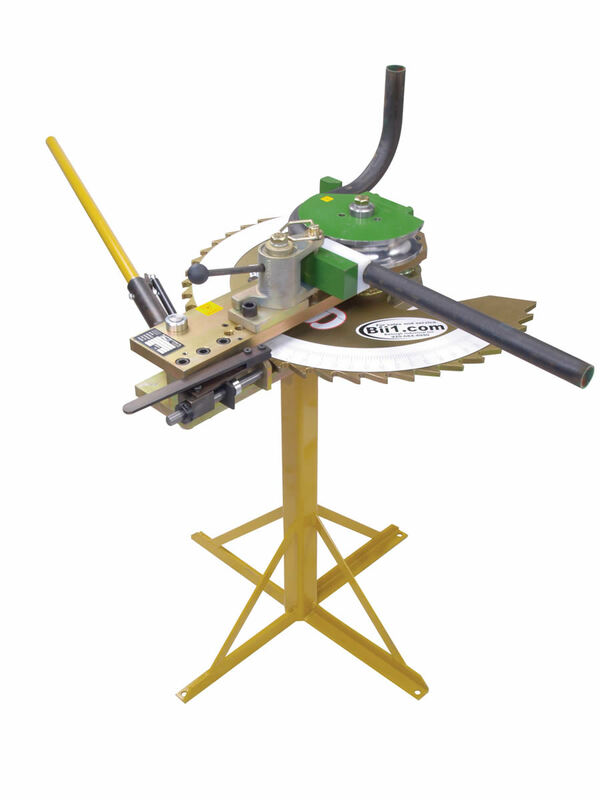 This manual tube bender uses a large diameter indexing plate that allows the fabricator to bend up to 206 degrees (180 degrees plus spring back) in one shot without having to re-index and re-pin common on most other manual pipe benders on the market. Each pull of the handle bends the material approximately 8 degrees. A tension spring back mechanism holds the position as the bend mechanism grabs the next tooth on the index wheel. When requirements are for lighter gauge materials this tube bending machines indexing unit can be shut off and the handle can be put into a manual override housing that allows the operator to simply walk around the manual bender and bend without the power of the indexing unit. Thus, this manual pipe bender is very versatile and great for bending up to 1-3/4 in OD tubing with a wall thickness of .095 in and 1 in schedule 40 pipe. The RDB-100 manual tube bender includes the stand, degree dial, and handle. A large degree dial displays your bend angle and all the tooling has a start of bend indicator line so complex bends can be made with ease. A quick release counter die system allows for quick loading and unloading of the material. To complement this manual pipe bender for complex bends on varying planes, we offer accessories such as our plane of bend degree dial and bending software with layout capabilities during setup. Both of these items added to the manual bender, will save time and money.